The greatest feature of an award is its tremendous perceived value. Giving an employee a check for $50 for a job well done on a long term project may not be a great idea! But present him or her with a $50 award that they can display and you have one happy recipient. In addition, awards provide an added incentive for peers that may not have performed as well, Yet! 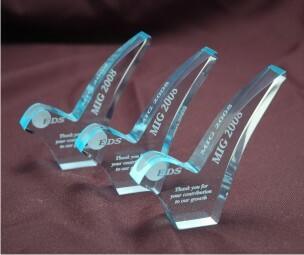 The following case studies show some of our favorite awards that we have helped in creating. Not all are expensive, but they are all unique and creative. The blue checkmark is a program that EDS introduced to motivate and recognize their sales force. In the old days before direct deposit, sales commisions were printed on blue checks and the blue color became synonymous with a succesful period. In order to bring back the excitement of the blue check, these fun checkmarks were created. Everytime a salesperson qualified for a bonus check, they were also awarded an acrylic check. The program was very well received. At the end of the year, the sales reps are able to turn in their checkmarks for additional prizes.